Handelabra Games have been creating board game ports since 2013. Their first title was Sentinels of the Multiverse which they spent a few years updating with expansions and additional features. 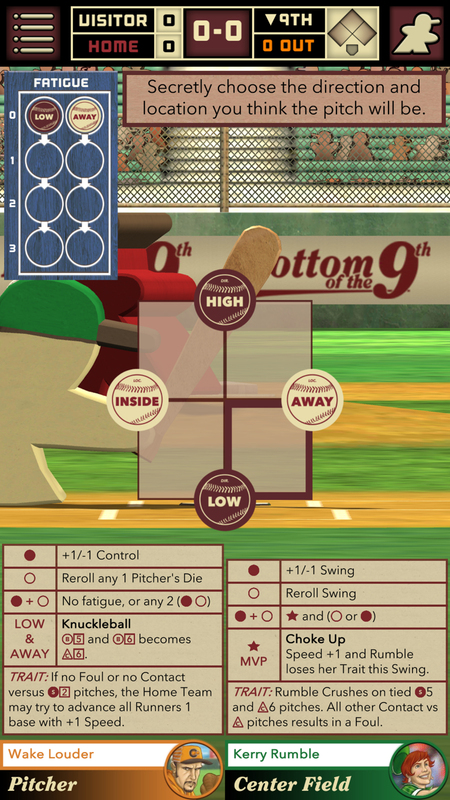 Earlier this year, the studio released their second game, Bottom of the 9th. Only a few months later and Handelabra is in the news again, this time announcing a Kickstarter to create a digital version of One Deck Dungeon. You can check out the Kickstarter here. Handelabra Games was formed in 2013 as an offshoot of Handelabra Studio with a focus on tabletop ports. The company was founded by Jeremy Handel and John Arnold with the stated motto of “play is important.” They strive to create games which are fun for players and manage to take the spirit of the original game, combining it with the convenience and streamlining offered by a digital platform. Jeremy Handel is the CEO and in charge of marketing and business development while John Arnold is the VP and lead developer on all Handelabra Games projects. Sentinels of the Multiverse: Sentinels is a deep, extremely challenging co-op card management game which pits a team of heroes against a villain in a classic superhero battle. On the rare occasion that one or more of the heroes is still standing and the villain is defeated, the players win the game. Being a co-op, the difficulty is built into the game itself, requiring no AI for an app implementation. The game has proven to be a favorite of solo players with the difficulty, setup variations, and large supply of expansions providing the kind of replayability solo players demand. Sentinels was a great first game for the studio to develop. They were able to release the game, then roll out expansions (using Kickstarter to fund some of them), and generally perfect and expand the experience for users. The end result is fantastic port that Handelabra must be proud of. ​Bottom of the 9th: Earlier this year, Handelabra released their second port in the form of a quick-hitting, luck based baseball game. Quite the turnaround after Sentinels. We are happy to report that Handelabra knocked this one out of the park as well (pun definitely intended). While the game is lighter, the implementation is still very strong. The game does a great job of replicating the most tense moments of a tight baseball game. ​One Deck Dungeon: Currently on Kickstarter, not a lot is known about the implementation, but the game presents itself as a cooperative, simplified, but deep, dungeon crawler. Players battle through a series of rooms on their way to a final boss battle. Each room contains obstacles, uncovered by card draws, which present challenges and rewards. Players increase their hero’s abilities with each completed conquest, powering up for the tougher challenges that await. One Deck Dungeon certainly shares some basic similarities with Sentinels; a difficult, card-based co-op. The game itself is a bit simpler, but still provides a deep challenge. Pixelated Cardboard (PC): Please tell us a little about your Handelabra Studios and how you found yourselves in the business of developing board game apps. ​Jeremy Handel (JH): In 2009, I got a bee in my bonnet about starting an app company. The app store was less than a year old on the iPhone, and I saw it as a great opportunity. I knew John “virtually” via the Ars Techinca gaming forum. We had played Halo and Rock Band together and John had actually coded a web app to scrape the official Rock Band rankings to look for just other forum members so we could all compare scores. As many people probably know, John’s handle most places is “Migrant Programmer” so one day I just asked him “so what is it you program? Any interest in this new mobile app thing?” He was game, so we started Handelabra Studio and our first app, StyleAssist, for creating a photo journal of all your hairstyles over the years. We also made apps like Better Clock, an alarm clock replacement, and GAME.minder, a proto-social network for tracking video game release date information. After a couple years, we made a game called Uncle Slam (which you can still get on the App Store) which was a gentlemanly game of presidential boxing. Its working title was “Presidential Pugilism.” To promote that game, we went to PAX Prime 2011, which led to a fateful meeting with Christopher, Adam, and Paul - a little company called Greater Than Games. PC: How did you end up with Sentinels of the Multiverse as your first title? ​JH: Our Uncle Slam booth was up on the 6th floor, right next door to Greater Than Games. During setup, we met the guys, tried Sentinels and they tried Uncle Slam. John fell in love with the game immediately and went home with his first edition copy. Not being a huge tabletop gamer at the time, I was more drawn to the characters and the story and immediately saw the potential for a partnership. We left that show saying “Hey, if you ever want to think about adapting this game for digital, let us know.” Over the next two years, we continued to push Uncle Slam, GAME.minder and some other things, including a game tracking app called Sentinels Sidekick. This was a passion project of John’s that he came up with to make tracking the game on the tabletop easier. Every few months we would catch up with Greater Than Games at PAX shows, and I would remind them that we were ready and waiting if they were. Sentinels had continued to grow, several expansions had been released and Greater Than Games had released several new titles as well. Then in January of 2013, I got an email from Paul saying they felt it was time to move forward. Part of the deal made Sentinels Sidekick the “official” Sentinels helper app and brought the card art into that app. At this time, Handelabra Studio was having a hard time being effective with our app projects, and frankly after making Uncle Slam we all just really wanted to be a game studio. After a few months of meetings and discussions, we had a contract to make Sentinels of the Multiverse: The Video Game, and a new company, Handelabra Games rose from the ashes of Handelabra Studio. We would now be a purpose built game studio focused on the digital tabletop. PC: Bottom of the 9th was a pretty big departure from your work on Sentinels, was it fun to work on something different? John Arnold (JA): We enjoyed the chance to bring a very different kind of game to digital and take advantage of some new technologies. Sentinels was developed in 2014 and uses an older UI framework. Even though we've been improving it and releasing lots of expansions, there's little reason to make large changes to how it works. Sentinels also has really only one kind of game component (cards). With Bottom of the 9th we had more components to play with - tokens, dice, and an actual board. We used the latest Unity UI frameworks and other assets to create a great looking game. One interesting aspect is that the game board of Bottom of the 9th isn't really critical to gameplay - it's more of a thematic component. So instead of just literally putting the board into the game, we decided to make the ballgame come alive with a 3D environment where meeples are playing baseball and taking actions based on what happens in the game. That was a lot of work but we're happy with how it turned out. PC: How did you land on One Deck Dungeon as your next title? What’s the elevator pitch as to what will make this game translate well to the digital world? JA: We're always looking for great tabletop games that are "on the cusp" as we say. Such games have a solid initial following, and have potential to go big, but they haven't broken through to the mainstream. That was Sentinels in 2013, and Bottom of the 9th and One Deck Dungeon now. With titles at that stage, there's a fan base to help build popularity with a digital version. One Deck Dungeon also has a particular appeal to the rogue-like market, which is strong on Steam and tablets. Since its design heritage is from video games, we think it can succeed going full circle. PC: After a few years supporting and expanding Sentinels, you release Bottom of the 9th earlier this year then quickly follow that up with the ODD Kickstarter. Is this a deliberate change of plans to produce more titles or just a result of how the timing worked out? JA: One thing to consider is that One Deck Dungeon is actually our 12th product. Sentinels was the first - then 9 expansion packs (so far) - then Bottom of the 9th, and now One Deck Dungeon. Even though the expansion packs are sold as IAP within the Sentinels app, the development cycle is similar to any other new product in many ways. So it was really a decision to create more products within Sentinels first before developing other games. We still have three more expansion packs to develop for Sentinels once they are released by Greater Than Games on the tabletop. JH: Building on what John said, once we caught up to the point that we’d adapted most of what is currently available on the tabletop for Sentinels, we knew it was time to start slotting some new projects into the pipeline. And honestly, it was always in our plan to be working on multiple games. The cool thing about digital tabletop is that the games themselves can be just as engrossing as other strategy games like Civilization, but the development budgets don’t have to go into the millions. And to answer the question directly, we did make a deliberate decision to go with some smaller scale projects for the moment. As much as we continue to enjoy working on Sentinels expansion content, the actual development cycle for Bottom of the 9th was pretty comparable to the 1.0 release of Sentinels. We really broke ground on that project in March of 2014, and launched in in October 2014. With Bottom of the 9th, it was January 2017 to August 2017. PC: One Deck Dungeon looks great from what we’ve seen on the Kickstarter page. One question I’ve already noticed being asked across social media is if there are plans to take it to Android and iOS. Why is ODD being developed for Steam first and are there plans for a mobile version to follow? JA: We think One Deck Dungeon is best suited for Steam and expect to have the most sales on that platform. We're launching first on Steam, but plan to go to Android tablets and iPad in the future. Phone support would require a notably different UI, and we would want to make that a great experience, not just a shrunken down tablet UI. When we brought Sentinels to smartphones we spent a lot of effort making it play really well on that form factor. The other major reason we're launching first on Steam is that we need support from Kickstarter backers to complete the project. Fulfilling app rewards on Steam is easy and well supported by Valve; not so much on Android, and not at all on iOS. We are aware that other developers have attempted to fulfill mobile apps on Kickstarter (with varying levels of success & failure) but it's completely against Apple's policies and could result in removal from the App Store. We aren't willing to put backers' money or our company's future at risk in that way. After the Kickstarter campaign succeeds and we launch on Steam, we hope to bring the game to iOS and Android for sale on their respective app stores. PC: Why did you choose to go the Kickstarter route with ODD? JA: The main reason is the simplest one: we need the money to make the game. Software development is expensive! We're a small company but we still have bills to pay and we compensate our employees & contractors fairly. Aside from that, Kickstarter is a great way to find out how much demand there actually is for a game (or any project for that matter). If a campaign fails, that's not really a failure - it's a learning experience. We've seen plenty of projects try again and succeed on Kickstarter after making changes. And of course, a successful project is validation that you're doing something right - along with the money and impetus to make it happen. PC: Are there any particular stretch goals you are extra excited about with the Kickstarter campaign? JA: I'm hoping we will reach the Forest of Shadows expansion stretch goal - that will give us the budget to go the extra mile on development and keep the digital version moving forward with new content for a while. JH: Some commenters immediately started speculating on a crossover from Sentinels. We thought that sounded like a great idea so we brought it to Greater than Games and they agreed. I’m really pleased that they were willing to let Fanatic come out and play in the Dungeon. PC: You’ve used Kickstarter in the past for some of the Sentinels content, to fantastic success. Lately we’ve seen a few other big name digital ports look towards crowdfunding. Do you think we will see more and more digital ports go this route? What are the primary advantages or disadvantages of crowdfunding from your experience? JA: I think we'll see it more, for the same reasons I mentioned before. Software development works on a different economic model than board game development. Board game designers are, for whatever reason, often expected to develop their game "for free" and then printing a prototype or small run is relatively inexpensive. If they go to Kickstarter then the amount raised more or less correlates with the number of copies they can print and sell. But for apps, it costs a lot of money up front to develop, regardless of how many copies you sell. Using Kickstarter helps you gauge demand and avoid the risk of building a game that doesn't sell well enough. The main disadvantage right now for digital ports is that you can't reliably use Kickstarter for delivery of mobile apps. If Apple puts together a sanctioned mechanism for that, it will be a great boon for mobile app developers. PC: Aside from your own, do you have any favorite board game ports for Android or iOS? JA: The game I've been playing the most recently is Legendary DXP. It had a pretty rough launch, but the developers have been improving it a lot over the last couple of months. Galaxy Trucker is a great app that deservedly snatched some awards from us back in 2014. And I have to mention one of the best of all time - Carcassonne on iOS. That app set a standard that we have measured our work against since day 1. JH: Right now I've been playing a bunch of Through the Ages. I mentioned Civilization before and that wasn’t an accident. I love that type of game and Through the Ages really nailed it. Another fairly recent one I was really impressed with was Colt Express. PC: Do you consider yourselves big fans of tabletop games? What are your all time favorite board games? JA: I grew up playing Monopoly, Pay Day, Risk, and the like. It wasn't until 2003 that I was introduced to Carcassonne, Citadels, Settlers of Catan, Alhambra, and other great modern games. Since then I've been a big fan of tabletop games, both physical and digital. It's hard to pick favorites but I'll mention a few on my shelf. Sentinels of the Multiverse is unsurprisingly my favorite game overall and top co-op game. I love Carcassonne (core game) and play it competitively when I get a chance. Viticulture hits the spot for worker placement. Wings of War is an old favorite I haven't gotten to the table for a while. For small games I really like Dead Drop, Brew Crafters Travel Card Game, and Lords of Scotland. I am always down for legacy games if I can get a group organized; SeaFall isn't perfect but it's a lot of fun! You should probably just stop me now, I'll keep going..
JH: I’ll be honest, before PAX Prime 2011, and our fateful meeting with Greater Than Games, I hadn’t played a board game much newer than Catchphrase. Since then, I’ve definitely expanded my horizons. After playing Sentinels, I picked up Timeline, played some Munchkin and started personally backing more tabletop games like Tiny Epic Galaxies, Gruff and most recently STEM: Epic Heroes. I don’t have a lot of friends locally who play unfortunately so I don’t play as much as I would like which is actually some of the reason for my big push with the digital tabletop. These games are so much fun to play, but if you can’t get to the table, there’s always a virtual tabletop waiting for you! We'd like to give a big thanks to Jeremy and John from Handelabra for taking the time to answer our questions. We appreciate them providing a great look into their world as a board game porting studio. We'll end it with one final reminder to check out One Deck Dungeon on Kickstarter.